In this post, I am going to review a Book Titled as Visual Studio 2012 and .NET 4.5 Expert Development Cookbook and written by Abhishek Sur. This book got published recently and I am feeling really good to review this book. As the Title of the book states, this book covers about Visual Studio and most of the topics that are widely used amongst .NET developers under the umbrella of .NET. The book starts with Visual Studio 2012 IDE features and this chapters discusses most of the features that are available since beginning and introduced with the new version. I can assure you that Visual Studio IDE provides lots of features that are very helpful in our day to day development and almost half of these features is not used by most of us. After reading this chapter, you’ll feel that now your day to day coding become easy and more manageable. Second chapter covers the insights of .NET programs and Memory Management. 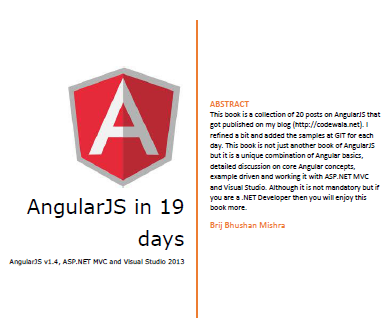 This chapters discusses from writing the code, compilation, binaries , the execution in detail. If you want to know the little insight that How all these compilation, packages and execution takes place, you’ll really like this chapter. Third chapter talks about Asynchronous programming in detail. Most of developer either does not write the asynchronous programs or do not follow the best practices. This chapters covers all the aspects of asynchronous programming with proper code snippets. it also suggests that in which scenario what pattern one should follow. Fifth Chapter covers the changes in WPF and talks the topic like MVVM pattern, Ribbon User Interface and WorkEvent pattern in WPF with examples. So if have worked on WPF you’ll get to know the enhancements made in it. Sixth Chapter talks about Touch-sensitive device Applications in Windows 8. This is relatively new topic and covers about different flavors of writing windows 8 apps. In all, after reading this chapter you’ll get practical knowledge on writing Windows 8 apps and app life cycle. Last (Seventh) Chapter and it is also the chapter covers about Communications and Sharing about Windows 8 apps. It is relatively advance topic and talks about the communication between multiple windows 8 apps and working network enable windows 8 apps. After getting basics of Windows 8 apps in last chapter, this covers advance topics wit examples. One thing that I see as a flaw considering a common developers that most of the chapters are little lengthy includes more than 50 pages and cover lots of things. If you are book lover then it should not be an issue but for normal developer, you start a chapter and keep reading little long to complete a chapter. At last, I would highly recommend this book to those who want to learn the changes took place in .NET 4.5 including IDE and other various technologies like ASP.NET, WPF , Windows 8 apps. This book includes many code snippets and example so that once gets practical knowledge with diagrams whenever required. As this books covers most of the topics so it focuses mainly the changes in .NET 4.5 and gives brief about the earlier existing feature. So it’s better if you have earlier working knowledge on the technologies that it discusses.